Atmospheric filling-up of helicopters, airplanes or lorries. Filtering elements : FIPOCA or Stainless Steel Media. Air breathing for oil or Jet fuel storages. Pressurised filling of Ariane launcher 2nd stage tanks with liquid ergols. 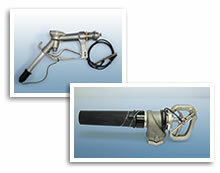 Flexible hose fitting designed for fueling an helicopter in stationary flight above a navy ship.